The City of Yarra is an inner metropolitan municipality which is home to a diverse community of about 79,500 people. Yarra’s 19.5 square kilometres include the suburbs of Abbotsford, Burnley, Clifton Hill, Collingwood, Cremorne, Fitzroy, North Carlton, North Fitzroy, Princes Hill and Richmond. Parts of Alphington and Fairfield – south of Heidelberg Road – are also included in Yarra. The City of Yarra has a rich multicultural community. Yarra residents are as diverse as Melbourne itself having come from as far afield as the United Kingdom and Ireland, Italy, Greece, the former Federal Republic of Yugoslavia, Turkey, the United States of America, India, Thailand, Malaysia, Vietnam, the Philippines, East Timor, China and Hong Kong, Japan, South Africa, and other African nations such as Ethiopia, Somalia and the Sudan. Yarra’s diversity, with almost 28% of its residents having been born overseas, is similar to the Melbourne Statistical Division with 29% residents born overseas. Yarra’s Multicultural Partnerships Plan 2015-2018 aims to ensure Council’s accountability to its culturally diverse community, providing services that are accessible and as culturally relevant as possible. It provides a blueprint for staff that supports best practice delivery of services to residents, businesses and visitors to Yarra, and makes specific note of the contribution of refugees and asylum seekers to our municipality. Yarra City Council has been a Refugee Welcome Zone since 2002, and it was one of the first local governments to join this initiative. A Refugee Welcome Zone is a Local Government Area which has made a commitment in spirit to welcoming refugees into the community, upholding the human rights of refugees, demonstrating compassion for refugees and enhancing cultural and religious diversity in the community. 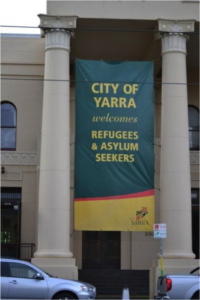 In 2005 when the first Refugee and Asylum Seeker Statement was adopted by Council, the welcome banners stating “City of Yarra Welcomes Refugees and Asylum Seekers” were hung outside the Collingwood Town Hall on special occasions such as Refugee Week. Refugees and Asylum Seekers from three town hall sites – Collingwood, Fitzroy and Richmond, and continues to display them. Council adopted a revised Refugee and Asylum Seeker Statement in 2015, which outlines Yarra’s commitment to a respectful and compassionate approach to Asylum Seekers (see below). Preamble While Council does not provide direct settlement services to refugees and asylum seekers, it provides and manages a range of services and activities that assists and supports refugees and asylum seekers in the community, including maternal and child health services, sports and recreation, libraries, youth and family services. Council has the role of facilitator of a range of partnerships and networks that provide services to asylum seekers and refugees. Council also funds projects and activities by community groups and organisations that support multicultural groups, and advocates for appropriate services that support the needs of refugee and asylum seeker communities. Recognises and welcomes all people who have arrived on humanitarian visas, people seeking asylum and those who come from refugee backgrounds who arrive on other visa types, including family migration and skilled migration. Recognises the United Nations definition of an asylum seeker as an individual seeking international protection but whose claim has not been fully decided yet. They are known as asylum seekers while their refugee status is being determined. Recognises the journey of asylum seekers and refugees who are often fleeing from war and human rights violations. They have often experienced trauma and persecution and should be treated with dignity and compassion. Will provide opportunities for refugees and asylum seekers to actively participate and contribute in community life. Will celebrate and acknowledge the contributions refugees and asylum seekers have made to Yarra and continue to do so, recognising these communities have inherent strengths and resilience. Council unanimously voted in 2010 to permanently display the Welcome Banners to Refugees and Asylum Seekers from three town hall sites – Collingwood, Fitzroy and Richmond, and continues to display them. As stated in Yarra’s current Multicultural Policy 2010-2014, Yarra City Council welcomes refugees, asylum seekers and other humanitarian migrants to the municipality with respect and compassion and facilitates a responsive resettlement response. Yarra has continued to co-convene (and fund) the Yarra Settlement Forum (YSF) with CoHealth (formerly North Yarra Community Health) which looks broadly at settlement issues of all new arrivals with a special focus on refugees and asylum seekers. Members of the YSF include services with a focus on supporting refugees and asylum seekers (eg. Asylum Seeker Resource Centre, Fitzroy Learning Network, etc). supporting partnerships between local community groups and service providers to enhance support for refugees and asylum seekers. Council assists new and emerging community groups to access the Community Grants program by providing training sessions and one-on-one support in building the groups’ capacity in grant-seeking. Council organised a Refugee Week event in 2014 to raise awareness in the wider community of refugee and asylum seeker communities. The event included speakers, short films and discussion. Emerge Festival – conducted at the Fitzroy Town Hall, commemorates United Nations World Refugee Day and celebrates Refugee Week in Victoria. 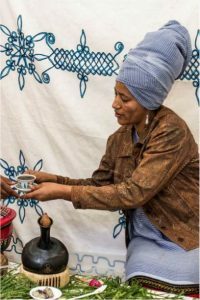 The only festival of its kind, Emerge unearths the incredible talents within the refugee and asylum seeker community. The festival provides an opportunity for people of all ages and backgrounds to share and celebrate rich and undiscovered cultures, and Yarra supports this event annually. World Refugee Day Rally – usually held on the Sunday closest to World Refugee Day, this rally is partly funded by Yarra, and involves a march throughout the city, concluding at the Emerge Festival, Fitzroy Town Hall. Palm Sunday Walk for Justice for Refugees – this public march is held annually by the Refugee Advocacy Network on Palm Sunday, and City of Yarra is proud to donate funds to this and promote the event to its staff and networks. Multilingual Services: Various language services are offered to people of refugee background, to help residents communicate with Council. Interpreting services: Council provides a free interpreter service for residents who need to communicate in another language with Council officers. Multilingual telephone informationL Residents can call our multilingual telephone lines to hear pre-recorded information about Council services including: contact information; garbage, waste and recycling services; aged and disability services; child and family services; libraries in the municipality that have multilingual reading collections. These information lines can also connect residents to an interpreter in order to communicate directly with a Council officer. Multilingual website: Residents can read information in over 70 languages on the Council website via use of Google translate. This function allows for the translation of content of every Council webpage including forms and attachments, increasing accessibility to a wider audience. This service is not as a replacement of existing translation services, but rather as a supplement to language services already offered. Anti-Racism Campaign: Yarra has pledged its support of the Australian Human Rights Commission’s Anti-racism campaign: “Racism. It stops with me”. This campaign is supported and promoted across various avenues, and Council encourages community to also join in the campaign. Further initiatives are currently being developed to continue promoting this campaign. Yarra Interfaith Network (YIN): YIN is a collection of faith based leaders and representatives who meet regularly to share dialogue on issues of spirituality. The Yarra Interfaith Network (YIN) formed in 2011 and became an incorporated association in 2013, with the aim of contributing to peace and harmony to the Yarra Community through dialogue, cooperation and understanding between people of diverse cultures respecting the integrity of each other’s beliefs, cultures and traditions. Council has supported the formation of this network and maintains a continuing relationship.